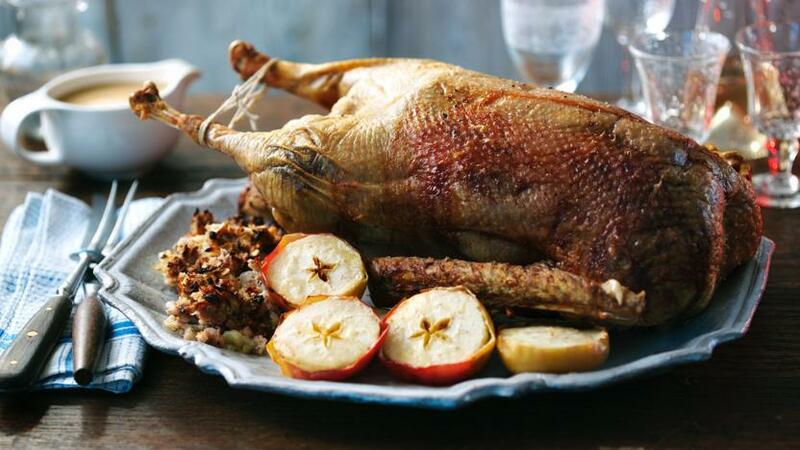 Try roast goose this Christmas, served with delicious stuffing and lashings of flavoursome gravy. Put the quartered onion and three bay leavers into the goose body cavity and cover the legs with folded triangles of foil. Roast the goose for one hour, then take it out of the oven and put on a board. Carefully drain the fat from the roasting tin into a large heatproof bowl. Increase the oven temperature to 200C/180C Fan/Gas 6. For the stuffing, heat two tablespoons of the reserved fat in a large non-stick frying pan and fry the onions for five minutes, or until softened and lightly browned, stirring occasionally. Scatter the apple into the pan with the onion and sprinkle with the sugar. Cook for a further 3-4 minutes, or until lightly carameslised. Add the goose liver and fry for a further 1-2 minutes until browned. Place the mixture into a large bowl and set aside to cool. Stir in the breadcrumbs, sausage meat and sage to the onions, apple and liver once cooked. Season with lots of salt and pepper and mix well. Grease a 20cm/8in square shallow baking tin with a little more of the reserved goose fat. Spoon the stuffing mixture into the tin and spread evenly. Cover and chill until ready to bake. Place the eating apples alongside the stuffing. Brush the cut-side of each apple with a little more oil. Bake for 20 minutes, or until the stuffing is golden-brown and cooked through. 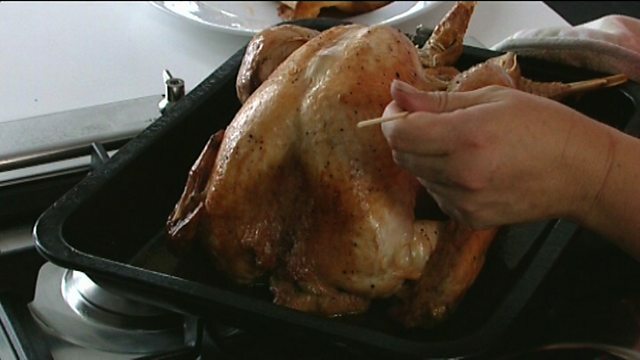 For the gravy, hold the roasting tin with a dry tea towel at one end, so all the cooking juices run to the corner. Remove as much of the goose fat as possible.